With the coming of 5G, programmatic bidding and AR, DOOH is rapidly evolving beyond its initial position as a video version of a static billboard. 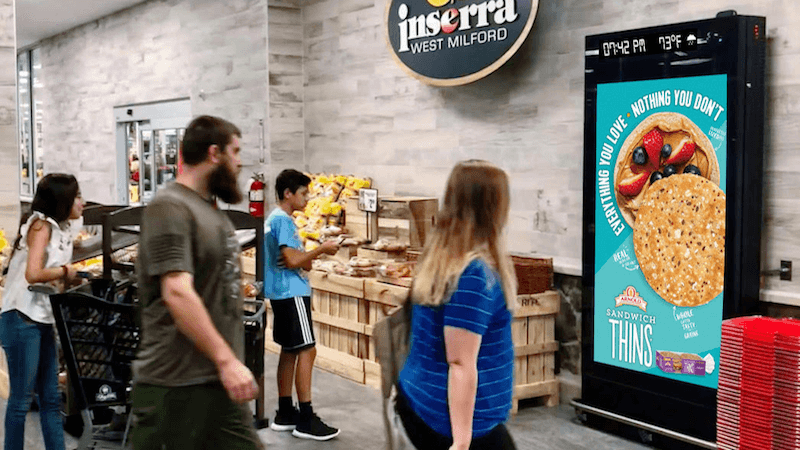 Digital out-of-home advertising is evolving so far beyond just being video billboards that, like mobile, the channel category may soon split into multiple channels. For Gregg Witt, chief strategy officer at youth-oriented marketing agency Engage Youth, outdoor digital screens can be seen as an extension of social media. In fact, the pairing of outdoor digital screens and social media on mobile devices has emerged as a distinct kind of user experience. Brick-and-mortar stores, for example, commonly display large screens, along with an invitation for customers to post their images into a continuing feed. In this mode, DOOH screens become a kind of ad hoc projector for visitors in a retail experience. Earlier this week, DOOH marketing platform Broadsign announced a partnership with outdoor advertiser Starlite Media to update its thousands of traditional, static screens into digital ones. But the transformation is not just to video versions of Starlite signs. Instead, the companies said, the screens are becoming informational kiosks inside thousands of retail outlets. To get to those retail outlets, many customers drive. That fact means there’s an emerging channel that can follow the would-be customer out a home’s front door via location-based messaging to a smart phone, pick up the campaign thread in an apartment garage, continue in the car’s dashboard screens and culminate in ads in a store’s displays and on the user’s phone. Location platform service HERE, for instance, has partnered with mobile platform Verve to expand on this newly targetable “customer journey.” Verve CEO Tom Kenney said via email that the companies see a traveler’s journey as connected steps in this emerging channel. In fact, one of the biggest reasons that DOOH is splintering as a category is that wirelessly connected screens will become available for virtually any surface, a possibility made more realistic by the coming of 5G. Vengo, for instance, is a service that offers digital vending machines, but the large screens in the machines are also used for ads unrelated to the vending machine’s offerings. David Weinfeld, Sales Director of Publisher Solutions at marketing agency Vistar Media, said via email that “advertisers are increasingly looking to engage with consumers through a combination of unique place-based activations,” including gyms, office buildings and schools. And the combo of physical location, the customer’s selection of a vending machine product and mobile location data help to pinpoint the ad to the audience. Jason Kuperman, Chief Product Experience Officer at OUTFRONT Media, pointed out that the integration of DOOH into the programmatic ecosystem and the use of mobile location-based data is moving out-of-home advertising from buying a sign at a given roadside location to buying audiences, as the rest of the digital world does. Advertisers don’t pay for TV screens, he pointed out. They pay for audiences, and that’s what’s beginning to happen in DOOH. This kind of targeting, he noted, is going hand-in-hand with context-specific messaging on DOOH inventory. Kuperman pointed to a JetBlue campaign run by OUTFRONT in New York City’s Times Square, which incorporated real-time traffic and flight schedule data. Essentially, those ads were customized for viewers based on third-party data. He pointed out that, increasingly, advertisers will also take into account the longer dwell time of certain DOOH locations, such as the estimated four to eight minutes in front of a screen that is located on a New York City subway platform. Similarly, OUTFRONT offers DOOH screens accompanied by geofencing, so that mobile devices can be targeted in coordination with the larger displays. Again, this is a new way for advertisers to pinpoint audiences when they make their purchase decisions. David Etherington, chief commercial officer of DOOH exchange Place Exchange, said his recently launched company is creating “viewing sheds” around DOOH screens, via third-party data. This lets the advertiser know nearby device IDs, and see if those mobile devices visit a web site that has been promoted in the large screen. SurveyMonkey ran a DOOH campaign in Times Square, which showed four influential celebrities — publisher Arianna Huffington, basketball player Draymond Green, tennis player Serena Williams and LinkedIn CEOJeff Weiner — inviting opinions from viewers. Passersby could launch a related online survey from their phones after scanning QR codes near the DOOH display. But all of this is only the beginning of DOOH’s evolution beyond its static billboard heritage. One possibility envisioned by Engage Youth’s Witt is the implementation of augmented reality (AR) — viewed through smartphones and eventually glasses — as a common overlay on digital billboards, especially in retail environments. DOOH advertising in the U.S. is booming, hitting what the Interactive Advertising Bureau said was a record high in 2018 of $7.4 billion. OUTFRONT Media says that consumers spend 70 percent of their time out of home, and that they are 48 percent more likely to engage with a mobile ad after seeing it on a DOOH sign. With so many permutations on the form, including an infinite number of inventory locations, screen types and interactive modes, DOOH is positioned to become a huge component in many campaigns — as an extensive continuation into the real world of the messaging efforts that have previously been largely confined to the dimensions inside TV and the web.